Working as a freelance artist or musician can be a trying experience, at best. It’s still a field where, in general, the work speaks volumes and can more than make up for a relatively shallow C.V. But how best to show off your work, and make sure that you’re getting as much exposure as possible? You could always set up your own self-hosted personal site, but that won’t necessarily reach all that many people, even if it does ensure your work is accessible. 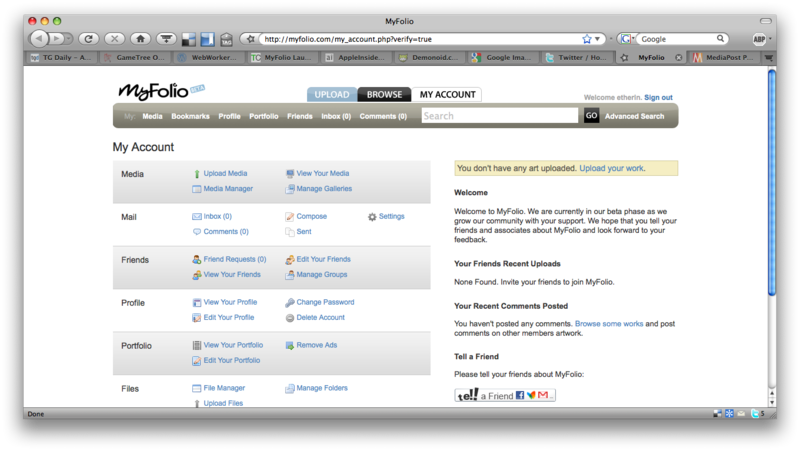 MyFolio may be a good resource to help supplement your own site. While you give up a certain amount of control in terms of overall design, you do get the benefit of belonging to a social network, thus increasing your chances of making connections, or at least taking some of the work out of the process. It’s a free ad-supported service, though there is an option to upgrade and remove the ads from your profile, at a cost of $2 per month. 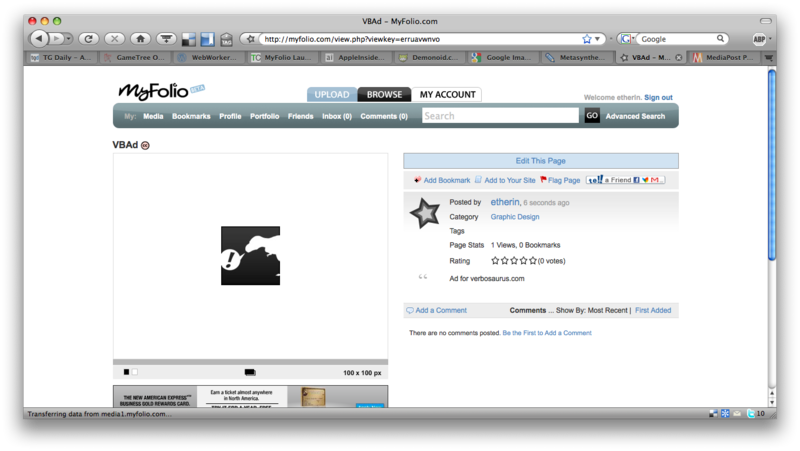 Even though I didn’t design it, I’m not displeased with MyFolio’s site. The design is simple and clean, and those familiar with Apple’s web site will see similar elements, like the gloss navigation header graphic. Your account home page is well organized, and breaks down your options according to broad categories. First and foremost is your Media panel, which is the main focus of the site, since this is where you can upload and manage your work. You can upload any movie, music, or image file, as long as you own the rights to it, and it’s under 100MB. Not enough for full-length feature films, perhaps, but it’s plenty for a compressed preview of said movie. You can also upload any other type of file you wish beyond those three, though they won’t be available for viewing or streaming, only download. 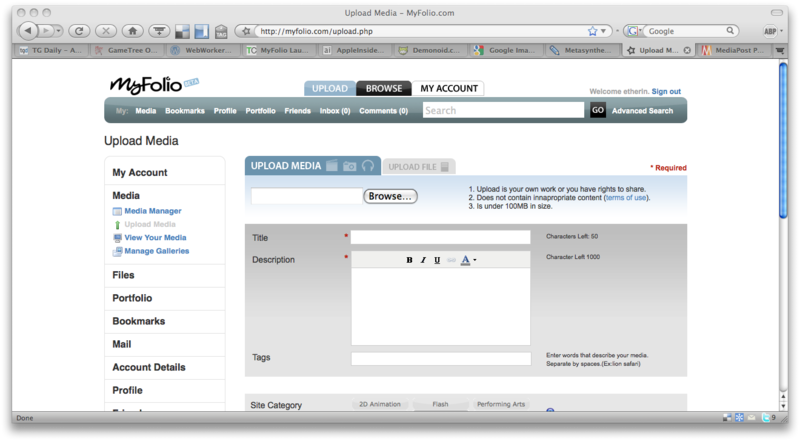 When you upload your media, you give it a title, description, and attach tags for search indexing. You then opt to include or exclude the item from your portfolio, though it will still be available in your gallery. MyFolio also offers you the option to categorize the item as either a creative work or as a “How-To”, which presents another interesting use for the site, and one maybe more in keeping with its role as an artist’s community. MyFolio is definitely not the first site out there to offer this sort of thing. deviantART springs to mind, but it suffers from the same sort of stigma as LiveJournal, in my opinion, meaning that I wouldn’t use it for showcasing professional work. MyFolio, in comparison, seems designed for the business-minded creative professional. Of course, it’s one thing to design something with a goal in mind, but it’s another for people to actually start using the site, thus making it successful, but MyFolio certainly looks like a promising place to showcase your work. Have you tried using MyFolio or a similar site to showcase your woirk? Share your experience in the comments. I have used my folio for showcasing some of my cartoon animation sketches and have received much attention from other artists and potential employers regarding my work. The website is more business-oriented than deviantART’s website and attracts enterprise individuals who are looking for artists to hire, rather than merely browsing through artwork. LiveJournal’s website contains too many categories besides art, so although it is a good social-networking site, its exposure is for art fans and those interested browsing through and commenting on blogs and drawings rather than hiring the artist for a job.